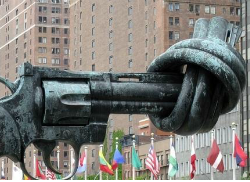 Tag Archive | "Arms Treaty"
Governmental leaders began meeting the week of March 18, 2013, to once again discuss the possibility of a U.N. Arms Trade Treaty (Arms Treaty) that would regulate the $60 billion global arms trade. The desire to create regulations governing the global trade of conventional arms arose in 2006. The General Assembly of the United Nations began negotiating such a treaty in July 2012 at a U.N. conference held in New York. In December of 2012, the General Assembly voted to continue negotiations on an Arms Treaty. If passed, the treaty would require all signatory countries to create national regulations to control the trade of conventional arms and the conduct of arms brokers. Provisions in the current draft of the Arms Treaty do not control domestic use of weapons in each signatory country “except when the trade of conventional weapons would violate arms embargoes or promote acts of genocide, crimes against humanity or war crimes.” The Arms Treaty, as proposed, calls on each country to determine whether an exported weapon would be used to violate international human rights, humanitarian laws, or be used for corrupt practices including terrorism or organized crime. Stacy Harper is a 2L at Denver University Law School and a Staff Editor for the Denver Journal of International Law and Policy.